To mark its one-year anniversary, the 10,000 Solutions platform celebrated some of the top innovative solutions at a showcase held on Oct. 9. Engineering students figured prominently in the 20 solutions teams selected to present at the event. The grand prize winner, SafeSIPP, took home $10,000. 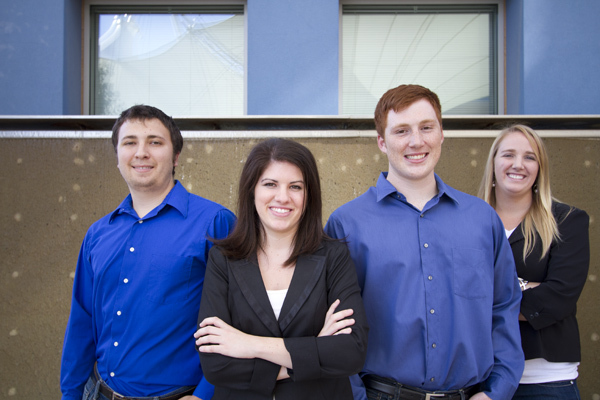 SafeSIPP team members include chemical engineering students Lindsay Fleming, Jared Schoepf and Taylor Barker, and marketing and supply chain major Jake Arredondo. SafeSIPP (Sustainable Innovative Portable Purification) is simultaneously solving two problems for rural communities in Africa: transportation and purification of clean drinking water. Team 33 Buckets won the People’s Choice Award and $2,000. Team members include Pankti Shah, Varendra Silva, Mark Huerta and Connor Wiegand, biomedical engineering, and Paul Strong, mechanical engineering. The team has designed a filter that will provide a girls’ school in rural Bangladesh with arsenic-free drinking water, and provide enough extra water that they can start a microfinance business and sell water to the community. Arizona Microcredit Initiative: Team members include Jeff Wells (computer science), Sean Gormley (accountancy and finance), Daniel Dodell (accountancy and supply chain management), Jordan Benesh (accountancy), Jenny Schnell (supply chain management and finance), Olivia Friend (global studies), Sara Boucher (finance) and Lorne Forcum (economics and finance). AMI is a nonprofit microcredit organization that offers small loans and business training to Phoenix-area entrepreneurs who wish to start a business. The BooGood Movement: Team members are Derrick Loud (biomedical engineering graduate student) and business graduates Kristopher Saunders and Salim Zeitoun. BooGood is selling high-quality bamboo bikes in the U.S. to support its overall mission of providing mobility to people in need. For each bike sold, an attachable hand-cycle will be manufactured in Africa and donated to someone in need. FlashFood: Team members are graduates Eric Lehnhardt (biomedical engineering), Steven Hernandez (computer science), Ramya Baratam (computer science), Jake Irvin (marketing and sustainability), and Loni Amundson (sustainability) and undergraduate Katelyn Keberle (materials science and engineering). FlashFood is developing a mobile-phone application to help establish networks that would connect restaurants, hotels, catering and banquet services with teams of people who would collect leftover food and transport it to community centers, churches and other neighborhood gathering places where it would be distributed to people in need. Motor vehicles meet cloud computing: In this innovation, created by Javier Gonzalez-Sanchez, a computer science doctoral student, vehicle data from fuel and oil levels to tire pressure is collected and sent to the cloud, where information is stored and classified. Machine-learning algorithms are used to create a profile of the user and vehicle and communicate the information to the user on any computer or smartphone. Sustainable Storm Solutions: The Rio Salado Habitat team is implementing innovative grate designs to protect wildlife habitats by removing trash and other contaminants from stormwater drainage that pollute drinking water and the surrounding environment. Sustainable Storm Solutions is led by chemical engineering student Jared Schoepf. Vantage Realized: Co-founders are graduates Gordon Freirich (mechanical engineering) and JJ Tang (finance) and industrial design major Nick Gough. Other team members are graduates Ami Bui (marketing) Teddy Lewis (visual communication design), Colin Ho (mechanical engineering), Kris Guiang (biomedical engineering) and graduate student Wade Gyllenhaal (mechanical engineering). Vantage Realized is developing a customized wheelchair designed to prevent injuries and ailments that often afflict long-term manual wheelchair users. Wii Smartboard: Team members are Eric Chang (mechanical engineering), Alexandria Davies (biomedical engineering), CJ Sandoval, Scotty O’Brien (electrical engineering) and Denise Oswalt (biomedical engineering). Wii Smartboard aims to integrate low-cost, interactive technology in the classroom through a Wii whiteboard which would enable smartboard access anywhere a projector is available, all for under $50. For more information on the 10,000 Solutions project, visit 10000solutions.org. Note: If we have missed one of your team members, or you’d like to share more information about your project, please let us know.